PRODUCT DESCRIPTION: Optigard flex is a non-repellent insecticide that is active against insects by both contact and ingestion. It is particularly effective against social insects such as ants but can be used to control a variety of nuisance insect pests such as cockroaches, beetles, bees, earwigs, hornets, boxelder bugs, fire ants, wasps, etc. 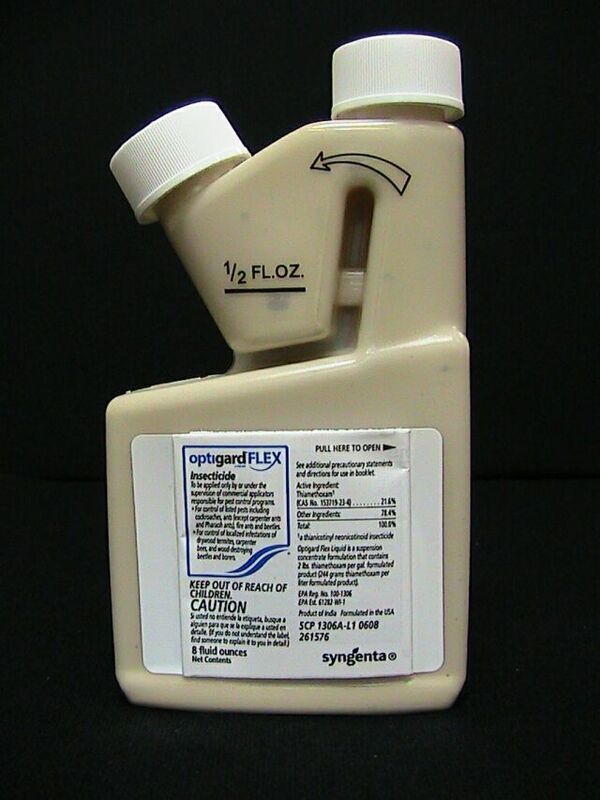 Optigard Flex may be applied as a perimeter band, as a spot spray, as a mound drench, and to voids to control a wide range of insects. It may also be applied to trees and shrubs to control honeydew producing insects that ants use as a primary food source. Optigard Flex offers true flexibility in treating ants and nuisance insects both in and around structures because its odorless and undetectable by the target insect. Once treatments are in place, insects will travel over the area and unknowingly pick up the active. Once its on them, they'll typically ingest some as well as share it with other members in their nest. In 1-2 days, most all of the nest will have some of the active on it. And when this happens, it's too late for the pest. By the 3-4 day, the active will turn on and when it does, any member of the target pest exposed will die. Typically this will take another 2-4 days but within 7-14 days, any nest will be dead. To insure good coverage for large populations with only 1-2 entry ways, be sure to spray their holes daily. Do this in the evening when they're all present inside. This way the next day the foraging workers will pick up the active and share it with other members of the colony in the coming days. WHERE TO USE IT: Versatile formulation that can be applied anywhere since its odorless. So both inside or outside the home; and as a liquid or foam. Inside only to be used as crack and crevice or void treatment. Not for surface application inside living spaces. Outside; use it on any kind insect mound, entry points, eaves and attic vents, along sidewalks, in mulch, on landscape and ornamental plants too. Termite Monitoring Stations can also be treated… See label for complete list. RATE OF APPLICATION: .27 to .54 Fluid ounces per gallon. Use 2 gallons per 1,000 sq ft of Application area. No bumble bee stings. This product is all it says it is. I had a bumble bee nest in an old junky barn and I couldn't walk in without being stung. I sprayed the barn in the evening and after about 4 or 5 days the entire nest was dead. It's great to have the barn back. Worked like a champ! Had European Hornets. Sprayed on and around the nest and they were gone after the first application. But I used it again for a couple of nights after that first application and have not seen them since. This is seriously good stuff. 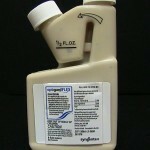 I wanted to tell you folks how happy we are with the results of using this product, Optigard Flex Liquid. I was somewhat hesitant because of the price of the product. Boy was I wrong. We had a serious bee/wasp problem on our deck, so that we couldn't go into the area without risking being stung. I ordered the product back on July 12, received it a few days later, and then used it on our deck July 19th. Even though I didn't use an entire gallon of the mixed spray, I did thoroughly soak the top of the deck area where the bees were coming and going. I made sure to spray it more than enough to soak down between the deck boards. And then we left it alone. Within TWO DAYS, there was literally NO bee activity. I poked into the area from the side after a week, and there was NO activity. I then left the area alone until just this past Saturday, August 6, when I checked it closely. ALL THE BEES ARE DEAD! As I investigated, I found that the paper nest was easily the size of a watermelon!! I chopped the nest down and threw it into the woods, along with scooping up the VERY DEAD BEES! Your product is worth every dollar! I will be using this product every spring as a preventative treatment. I will also be recommending your product whenever asked what REALLY WORKS on bees or wasps. We were fighting a nest of European Hornets in a dying tree 20 feet off the front porch. First week we tried wasp killer. Six cans later we gave up on that. The next week we tried tossing gasoline from a solo cup. They hated it, but 5 or 6 direct hits later they were still going strong. Time to get tactical. Enter the Optigard solution. We mixed up a gallon in a pump sprayer. We *might have significantly exceeded the recommended concentration. Next, we fit a piece of pipe insulation across the top edge of a truck passenger window and with the delivery end of the sprayer resting through a slit in the insulation we rolled up the window with the sprayer inside. Now we had a tank. One of the boys drove up next to the tree and one of the boys manned the nozzle and one of the neighbor's kid maintained pressure in the pump sprayer. An hour after emptying the entire gallon into the nest, we never saw another hornet in the air or on the tree but just a bunch twitching on the ground! Received my order, used it and was successful. Thank you! OMG we received the Optigard quickly. My husband sprayed the crepe myrtle (with maybe *just* a touch more than recommended) and I swear, he sprayed one night – I did not EVER see another European Hornet on those trees and later that night, the floodlights were flooding and NOT ONE hornet. My husband sprayed the crepe myrtles a 2nd consecutive evening, I think one week later I saw ONE hornet buzz by the floodlights once, and that was it. Finding random dead hornets around the back patio near the floodlights. Sprayed again today, I think it's been about 2 weeks – this stuff is the bomb! Get it. Use it. It does work. And BTW we sprayed in the evening from about 10 feet away from the trees in a stream (not mist) and saturated them, all the trunks and most of the leaves. Again, did this as directed by tech support, 2 consecutive evenings, and again about 2 weeks later. We will do again in 2 weeks and start again in early spring. Yhank you tech support ans Optigard! I was prepared to spray at least three times per your instructions, but the initial spraying killed the entire colony of yellow jackets which were buried in the leaves in my wife's plant bed. Great product! Our home is surrounded by giant hornets, but we cannot find any nests, and I'm not really sure what's attracting them here. I don't see any food source or trees they're girdling. They just keep showing up INSIDE our screened porch and also flying around our immediate house and pool area. We are surrounded by woods. Would this be the best product to try to eliminate them? If we just spray some of the bushes near where we've seen them is that good enough? The quick answer is yes. My instinct says you should spray any bush, shrub, tree or flower where you see them active. But don't forget the structure. If you're seeing them inside, they must be using some crack or crevice to gain access. So based on what you're seeing, I think spraying the homes exterior focusing on the surfaces outside and adjacent to the screened in porch will help. And as always, the more you treat the better results you'll have so spraying all entry points around the home would be smart. We have already sprayed the crepe myrtles once this spring, and them again 2 weeks later; however, tonight we just saw a European Hornet enter a small hole in our soffit in the front of the house. No wonder we never found their nest. Going to wait until dusk to spray inside the little hole and all around it. Will let you know how this effort goes ………… last year we sprayed the trees once and hardly ever saw another hornet. Any advice anyone has is welcomed! So the way this product works is that as a non repellent, it relies on target pests moving over the treatment. In general, the early part of the year won't be when these hornets are targeting plants (like your crepe myrtle) as much as they are spending their time building homes and nests. In this case, it would appear something is being formed up in the soffit and its keen that you spotted the activity. Spraying the hole and surrounding area for 3 nights in a row will ensure no nests are able to grow. Taking it a step further, it would be smart to spray all similar overhangs, soffits and where gutters meet fascia boards. These are common areas for hornets and wasps to use for nests and a good treatment in the spring can help get you "ahead" of the problem so you don't have activity this summer. Homes which have a history of activity tend to get more every spring so a good spraying of the home now will be worth the time. Amazing! We had bees coming and going through the deck boards on the back deck that we grill and eat on. There was no way of knowing where the hive was. We sprayed the deck boards in the evening and there were only a few bees the next morning! After spraying one more time all the BEES WERE GONE!!! Best of all this is safe to pets and children once it dries. My husband said it was very easy to mix and use. Well worth the price. We highly recommend it!!!! Thank you!!! AT LAST !!! I have been battling katydid killers for years in my backyard and on my deck and flower beds. I sprayed 2 nights in a row and now I have not seen a one. It has been so long since I have been able to enjoy my deck. Thank You Thank You! Awesome stuff! Worked great on my Bees. They were coming from under my deck. Tried everything and nothing worked until I tried this stuff. One application on my deck and the crack they were coming from and Bees no more! I'm shocked I got rid of them so easy. This stuff works. Just make sure you wear protective gear when you use it as it is a very powerful poison and works by absorption. Follow directions. Four applications and no more yellow jackets. Works well. Used this in my orchard for European hornets. They were distroying all my fruit. It worked great! I couldn't be happier. Will it work for stink bugs? Great question. Stink bugs aren't listed on the label but we have had many customer with Boxelder bugs use it and many had stink bugs too. Well, the Optigard worked well on both so even though it doesn't list stink bugs, it will work good for them.